Comedian Chelsea Handler has had no qualms about displaying her hatred for President Donald Trump. She even went so far as to debate Tomi Lahren, letting all of America know that she was ill-equipped to even discuss her own views. Handler couldn’t even come up with a single lie that Trump told after being asked to simply name one when she called him a liar. She has even gone so far as to call President Trump a Nazi and has compared him directly to Hitler himself. The tides have changed now that evidence linking Handler to Nazis has been found. Handler just announced that her maternal grandfather, Karl Stoecker, was a Nazi who ended up coming to America. Handler appeared on a new TLC show in which she explored her Nazi heritage. 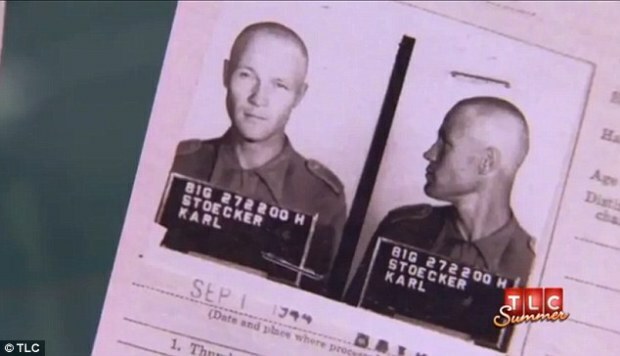 Karl Stoecker is pictured above. The TLC show allowed Handler to discover her Nazi roots, however, the show covered the story as if her grandfather was just another immigrant who settled in America. In reality, he was a P.O.W. that most likely stayed in Montana. When he was sent back to Germany he decided to immigrate to the United States for good. Handler recalled that during her childhood her grandfather was a loving man who she was very fond of. She spoke of her grandfather saying he was a “very, very strong man” with “a sense of humor.” Her family did everything they could to keep his connections to Nazi Germany a deep dark secret. This idiot actually claims that she had no idea about his past, but any idiot could have figured that he was a Nazi given his history. It’s pretty sick that Handler can talk about an actual Nazi like he’s a hero and label President Trump as a Nazi, calling him horrible names. To be clear, Chelsea is not at fault for the sins of her grandfather. It’s just odd that a woman who has direct ties to Nazi Germany so easily calls another person a Nazi and/or Hitler. What a disservice to be so flippant with a racist regime that murdered thousands. I’d wager to say it’s insensitive. I can’t help but also notice yet another example of liberal hypocrisy. For months, President Trump was ridiculed simply based on his ancestors’ last name being “Drumpf”. Handler’s grandfather was in the Third Reich and not one person has batted an eye. Hopefully, this exploration into the family history will help Chelsea Handler realize she shouldn’t be forcing her opinions on others. Once again, we have a textbook, out-of-touch liberal who wants people to know she is practically a saint in terms of her conscientiousness. Of course, she’s preaching from the back of a limousine.